If you use an iPhone to listen to podcasts, you likely started using the Apple Podcasts app. It works fine… at first. But there are so many other great options for podcast apps – for both iOS and Android. Some are iOS (iPhone & iPad) only, some are Android only, and some are for both ecosystems. Many of them include discovery options, playback controls, different sharing options, sleep timers, and more. They’re organized by operating system, starting with options that work on both platforms. We’ll link to their app store listing so you can quickly check them out. 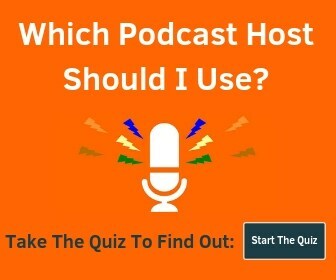 Podcast apps that are on both platforms. RadioPublic is a beautiful podcast app available on both iOS and Android. It’s free and doesn’t require an account or login – just start listening! You can stream or download episodes for listening offline, add private RSS feeds (not all apps allow this), import & export using OPML, and a ton more. Their team is very responsive to feedback and comments as well. Full Disclosure: I’m an investor in RadioPublic, a Public Benefit Corporation. Pocket Casts is an awesome app for people who listen to a lot of different podcasts. It has a great UI, light and dark themes, useful search and filtering options, and a lot more. Another useful tool is their sync option that lets you pick up where you left off on another device. Castbox is a new addition to this list for 2018, but they have some impressive features and amazing reviews. They have won several “best of” awards from Google and Apple in the last couple years as well. Not only are they on both iOS and Android, but they also have an Amazon Echo Skill, and Apple Watch & CarPlay support. Be sure to check out the in-audio search to find exactly what you’re looking for. Podbean is a podcast hosting company that also offers a podcast app – and now an Alexa skill. Their podcast app is easy to navigate and use, and they have hundreds of 5-star reviews. If you want to create a podcast on your phone, this app will let you record and upload to Podbean hosting account (free month of hosting with this link), making it unique it that you can both listen and create with one app. One of the useful things with Stitcher is the ability to search for episodes, not just entire podcasts. You can create playlists, find new podcasts, listen to news, and more. It’s a free podcast app that offers a premium subscription service for $4.99/month to remove ads and listen to original shows. It has won many “best of” awards as well. Laughable is focused on comedy but will take your podcast listening to the next level whatever your interests. Laughable lets you subscribe not just to podcasts of all genres, but also directly to thousands of comedians, journalists, actors, athletes, musicians, authors, politicians, and other people worth hearing. It’s dead simple to find your favorites and listen to their podcast appearances – even guest spots. They also have unique features and data like the Laughable Artist Graph that shows how audiences overlap for top comedians and podcasters. Apple has featured them many times in the App Store as well! TuneIn Radio is unique in that they offer MLB, NBA, NFL, and NHL with their premium subscription service. It works with CarPlay, Apple Watch, and Chromecast. It can also be used for free to listen to your favorite podcasts. Spotify is known for music, but they also have a curated podcast selection. I couldn’t live without it for music (premium version is more than worth it), and they have recently opened up the podcast side of things. If you host your podcast with some of the more well-known companies, you can easily request for your podcast to be listed on Spotify. If your favorite podcast isn’t there, just ask them to get listed – it’s easy! My podcast is hosted with Buzzsprout and it took 10 seconds to fill out a simple form and get on Spotify. Overcast is ad-supported, but the ads are other podcasts you might be interested in, and are targeted by category. You can also pay to remove them. 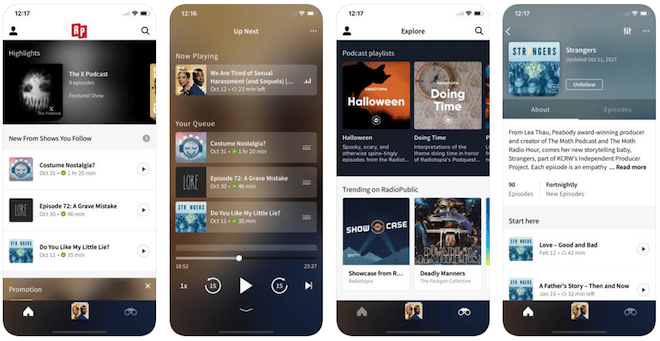 Castro 3 is a unique iOS podcast player – in a good way. They have a cool Inbox feature that lets you queue or archive new episodes – great for when you don’t want to listen to every episode for every podcast. There is a night mode you can turn on and off with a two-finger swipe. This is a well-designed podcast app that works great, especially when you are subscribed to many different podcasts. They also have iMessage and Apple Watch support. Downcast is a great app for organizing your podcasts and offers a bunch of useful features. It also has iCloud sync so you can pick up where you left off. Includes iPad, Apple Watch, and CarPlay support. They also have a macOS version for $4.99. PodCruncher has “unmatched playback control” offering playback speed control, gestures, landscape view, sleep timer, multi-speed slider, and more. iCatcher! Podcast Player lets you download and listen (or watch) your podcasts. It’s a universal app, meaning it works on iPhone and iPad, and they also have an Apple Watch app. Last, but definitely not least, is Castaway. You can download and stream podcast episodes, adjust playback rate, get notifications for new episodes, and more. Their UI is great and shows large artwork and has easy to use controls. This comes with your iPhone. Google just released their own Google Podcasts app in June 2018. Check out their announcement blog post for more details too. 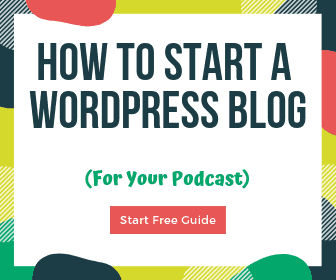 If you’re a podcaster, you can find resources and badges for your site on this page. The badge above will send you to our podcast if you want to see how direct linking works. Podcast Republic is my favorite android podcast app. It supports iTunes and YouTube channels, has live radio streaming, the ability to save podcasts to your SD card, automatic download, Android Wear support, and a ton more. It is ad-supported, but you can pay to remove ads. Podcast Addict is hugely popular. They have Chromecast and Sonos support, advanced playback features, sleep timer, a bunch of different discovery options, widgets, and more. BeyondPod has a great interface and millions of downloads. Doggcatcher has over 10,000 reviews. Lifehacker said it is “the best podcast [app] for Android”. Player FM syncs in the cloud, keeps your listening history, and lets you organize your podcasts however you’d like. Podkicker has over 50K downloads, 4,000 reviews, and overall people seem to like it. You can add your own RSS feed or search the iTunes directory. AntennaPod is a nice podcast manager with import, organization and playback customization.